The fan speed can be controlled by voltage or frequency variation regulators. The WD-KE range of fans are moisture resistant and are approved for installing in humid or damp environments. 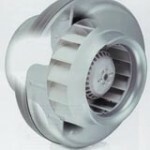 The fans are rated IP44 when installed in a duct system. The casing is manufactured from pre-galvanized steel. Automatic thermocontacts open if the temperature within the motor windings becomes excessive. The K series is designed for installation in ducts, theWD-KE series is designed to be used as wall mounted duct connected extract fans. All theWD-KE-fans have minimum 25mm long spigot connections. The fans have backward-curved blades and external rotor motors. To simplify the installation theWD-KE-fan has a fixing bracket together with screws for mounting the backet included as standard. The FK mountaining clamp facilitates easy installation and removal, and prevents the transfer of vibration to the duct. The fans can be speed-controlled via a stepless thyristor or a 5 –step transformer. To protect the motor from overheatingWD-KE 100 M and 125 M is impedance protected,WD-KE 100 XL-315 L has integral thermal contacts with electrical reset. The casing is manufactured from galvanised sheet and folded which gives the fan a close to air tight casing. Duct connected outdoor and wet room applications of the fan are possible duet o the air tight casing.